Arusha Crown Hotel is a six storey, 38 rooms hotel with an attractive architecture and each room has been elegantly designed to meet the requirements of the traveling executives and leisure tourists. All rooms in the hotel are tastefully furnished and luxuriously appointed with modern amenities designed to provide the ultimate in comfort and convenience. The hotel offers guests a choice of 5 Deluxe double bedrooms, 1 triple bedroom, 4 twin bedrooms, 4 double bedrooms and 24 single rooms. Most of the rooms are non-smoking, however few smoking rooms are available. The hotel provides free Internet access. Most rooms as well as public common areas such as lobby, restaurant and conference room have Internet access points. For the convenience of guests, few laptops are also available in the lobby area for common use. 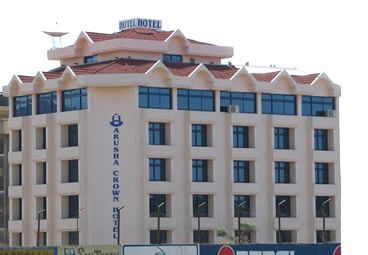 Copyright© Arusha Crown Hotel,2004-2014. All rights reserved.